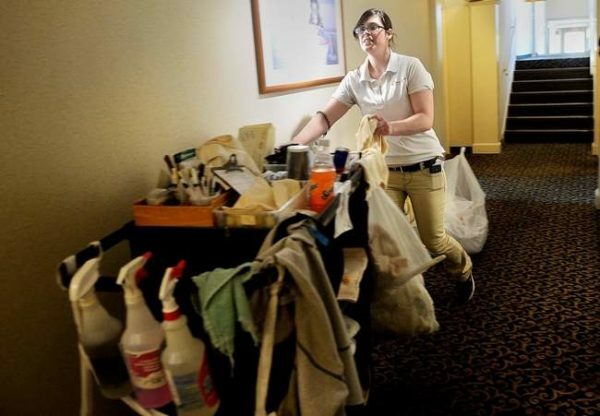 Trish Lizotte has been a room attendant at The Meadowmere Resort in Ogunquit for almost 3 years and the skill set needed is to be precise, fast, and a multitasker. For decades, the State Department’s J1 nonimmigrant visa program has provided opportunities for individuals from abroad to participate in work and study-related exchange programs in the United States. While the program has provided educational and cultural opportunities for foreign students, it has also provided a critical source of seasonal employees to businesses in the hospitality and restaurant industries in this country. Now, an executive order by issued President Donald Trump in April — Buy American, Hire American (BAHA) — has raised concerns that J1 visas will be restricted or eliminated in the future. Cavaretta said the Meadowmere employed five or six J1 applicants every year, usually working in housekeeping, food, and beverage positions. As a host employer, the business has certain obligations to the students. The Council on International Educational Exchange (CIEE), headquartered in Portland, is one of 40 organizations that sponsor exchange programs that send U.S. citizens abroad for work and study as well as bring foreign students here under the J1 program. They focus on two aspects of the J1 program, Student Work Travel (SWT) and Camp Counselor (CC). In 2016, CIEE estimates that 2,550 students came to Maine in the SWT program and 1,730 in the CC program. Nationally, roughly 100,000 students arrive via SWT and 21,000 via CC each year. According to Simon of CIEE, the program is open only to university students overseas that come here during their summer break, primarily to work in the tourism and hospitality fields. Most work in places with a seasonal need and cannot replace an American (one of the concerns targeted in President Trumps’ Executive Order). The students work for 12 to 14 weeks and then can travel in this country for a month, prior to returning to their home country. Meantime, CIEE and the Alliance for International Exchange are encouraging action to voice support for the program. Local chambers of commerce have communicated the need for members to contact their congressional delegation about their concerns over the program’s possible elimination. “H2B was a big mess this summer, J1 was the only saving grace,” said Eleanor Vadenais, president of the Wells Chamber of Commerce.